Background Little is known about how the different policies available to promote use of generic medicines affect the price per unit supplied or sold. This study compares the influence of pricing policies for generic medicines on atorvastatin prices in Australia, New Zealand, the Republic of Korea and Singapore, after market entry of generic atorvastatin. Methods The annual price of atorvastatin per defined daily dose supplied (price/DDD) was examined for each country from 2006 to 2015 (≥2 years before and ≥4 years after generic market entry). Prices were converted to international dollars and cumulative percentage price reductions were calculated for the first 4 years following generic entry. Results Prior to market entry of generic atorvastatin, New Zealand had the lowest price ($0.10/DDD), and the Republic of Korea the highest ($2.89/DDD). The price/DDD fell immediately after generic entry in all countries except New Zealand, which already had low prices. The largest immediate decrease was observed in Singapore (46%, year 1). By the fourth year after generic entry, the price had fallen by 46–80% in all countries; however, large price differences between countries remained. Conclusion New Zealand’s tendering system and use of preferred medicines resulted in very low atorvastatin prices well before patent expiry. Pricing policies in the other three countries were effective in reducing atorvastatin prices, with reductions of between 46% and 80% within 4 years of generic entry. Where tendering and use of preferred medicines were the mechanisms for atorvastatin procurement (New Zealand), prices were lowest before and after generic entry. Mandatory price cuts, combined with price-disclosure policies (Australia), produced similar relative price reductions to tendering systems (New Zealand, Singapore) at 4 years. By comparison, mandatory price cuts upon generic entry as the sole measure, while initially effective, were associated with the smallest relative reduction in price after 4 years (Republic of Korea). All health systems grapple with providing access to medicines while managing the costs. Use of generic medicines is one among a number of strategies used to improve the affordability of medicines and save money for health-care systems. In the United States of America (USA), it has been estimated that use of generic medicines saved US$ 193 billion in 2011. In Ireland, it was estimated that €228 million could have been saved in 2008 if generic medicines were used, where available, instead of originator brands. A study in selected low- and middle-income countries limited to assessment of 17 medicines found that if generic products were used, the potential savings would reach $15 million for Indonesia, $38 million for the Philippines, $39 million for Pakistan and $370 million for Chinese public hospitals (all amounts in 2008 international dollars). The savings achieved by health-care systems by using generic medicines is dependent on the price at which the originator product was purchased prior to patent expiry, the price at which generic medicines are purchased once available, and the extent of uptake of the generic medicines as a percentage of the market where brand and generic price differentials exist. There is widespread variation in these elements across countries. Variations in the price of generic medicines have been observed to range between 3- and 36-fold across countries, and uptake of generic medicines across European countries ranges from 5% to 80%. Different countries have employed a range of policies to influence the price and uptake of generic medicines in their health-care systems. Mandatory or optional generic substitution, where pharmacists may substitute a generic product that is equivalent to the branded product, is one mechanism used to promote uptake. Pricing strategies may include within-country (internal) reference pricing (i.e. the price is set relative to therapeutically similar medicines); external reference pricing, by taking an average of prices for the same pharmaceutical product in other countries; price caps (i.e. a maximum price that will be subsidized or reimbursed is set); and mandatory percentage price reductions compared with the innovator brand upon introduction of the generic medicine to the market. Where discounting to wholesalers or pharmacies occurs due to competition between multiple generic products, price-disclosure policies may be used to price products. Medicines can also be purchased via competitive tendering mechanisms, before or after patent expiry and entry of generic products to the market. Some countries do not regulate the price of generic medicines, allowing their price to be set by the manufacturer, with the expectation that market competition will achieve the best price. Several studies have examined the impact of a single policy on the price of generic medicines immediately after implementation;,,,,,,, however, little is known about how different policies affect the price per unit supplied/sold (i.e. accounting for both price and uptake), or how this changes over time following policy implementation. This study was set among four high-income countries in the World Health Organization (WHO) Western Pacific Region, namely Australia, New Zealand, the Republic of Korea and Singapore, all of which provide universal health care to their citizens. Across these countries, there is considerable variability in the pricing mechanisms for generic medicines. New Zealand uses a competitive tender approach, often limiting the market to one government-funded brand (with alternative brands available for out-of-pocket purchase on the open market). The tender may be won by the originator or generic supplier. New Zealand also uses similar, but not generic, products to negotiate commercial agreements with lower prices that reduce prices and costs overall (see case-study). Singapore has free pricing, allowing prices to be set by the manufacturer, but does tender for the medicines supplied in its public hospitals and government clinics., Australia and the Republic of Korea have regulated pricing policies for generic medicines, with mandatory percentage discounts referenced internally to the originator product at the time of entry of generic products to the market. Subsequently, the Republic of Korea has a second mandatory price reduction in the second year after generic entry, while Australia operates a price-disclosure policy of the ex-manufacturer price to the market. Under Australia’s price-disclosure policy, sales revenue, sales volume and the value of incentives or discounts provided to the supply chain are reported for medicines subsidized under the national Pharmaceutical Benefits Scheme, and a weighted average disclosed price (WADP) is calculated, based upon this information. If the current ex-manufacturer price is more than 10% above the WADP, it is reduced to the WADP. The pricing policies for generic medicines for each of the participating countries are summarized in [Table 1]. 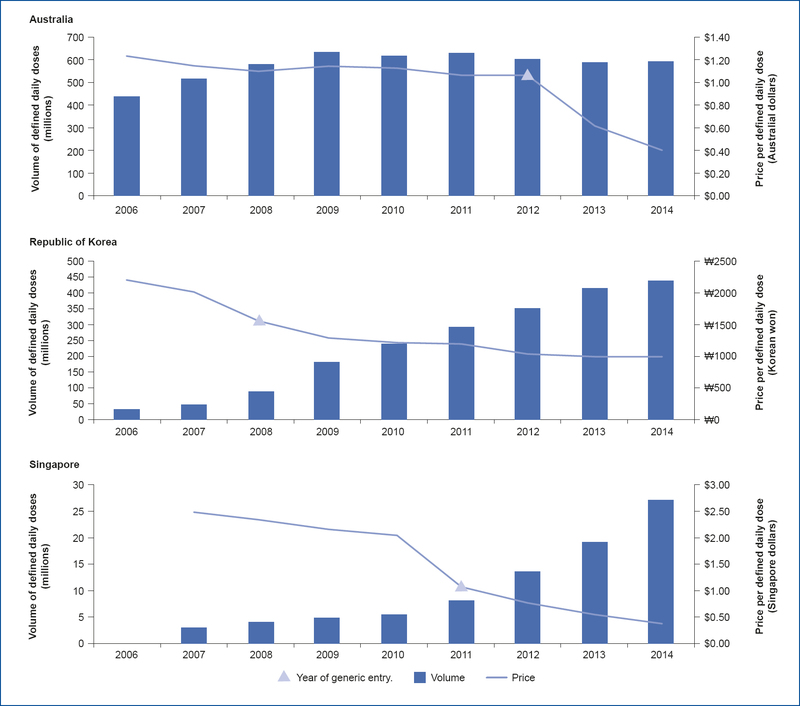 Generic atorvastatin was introduced into the markets of Australia, New Zealand, the Republic of Korea and Singapore between 2008 and 2012, providing the opportunity to examine the influence of these countries’ different pricing policies for generic medicines on the overall prices of atorvastatin. Other statins were available in the countries at this time and were used in different proportions (see Figure 1]); however, the focus of the present study was on the change in price in atorvastatin pre and post the patent expiry of atorvastatin.The aim of the study was to compare the influence of the policies for generic medicines on the total prices of atorvastatin therapy (single-ingredient products only) within Australia, New Zealand, the Republic of Korea and Singapore, after the introduction of generic atorvastatin. The study was undertaken using data covering the period 2006–2015. Generic atorvastatin products entered the national markets in the Republic of Korea in March 2008; New Zealand in September 2010; Singapore in November 2011; and Australia in May 2012. No adjustment was made for the month of generic entry, as data by month were not available. Data for each country covered the period for at least 2 years prior to entry of the first generic product, with follow-up data on prices undertaken for 4 years post entry of the first generic product to the market. All participating countries have national health insurance systems in place. Data for Australia were publicly available. Data for New Zealand, the Republic of Korea and Singapore were provided by government agencies. Data extracted for each country were annual prices for single-product atorvastatin (Anatomical Therapeutic Chemical [ATC] code C10AA05), as well as the annual volume supplied or sold, standardized to WHO defined daily doses (DDDs). The DDD of atorvastatin is 20 mg. National prices were converted into international dollars, using purchasing power parities (PPPs) from the International Monetary Fund. PPPs are more stable than exchange rates and reflect the value of a set basket of goods and services in different countries. Fixed-dose combination products containing atorvastatin were excluded from the analysis, because the majority of the combination products also included an on-patent medicine, and different pricing policies for combination products may have been in place. Data were sourced from Australian statistics on medicines, an annual publication of data tables that includes national estimates of the total volume of medicines dispensed under Australia’s Pharmaceutical Benefits Scheme. National government expenditure is also included. Data include community use of prescription medicine for the national population of approximately 23 million. Data were sourced from the database of the pharmaceutical management agency, PHARMAC. Data were supplied as average published subsidy prices (cost to the health system) per 40 mg tablet, per quarter of year. No volume data were available, but the average subsidy prices account for volume. To compare with the other countries, the price per 20 mg tablet at January each year was calculated, based on the average subsidy price for 40 mg in the same month. The actual cost was lower, owing to the presence of confidential rebates. Data represent all medicine use for the national population of approximately 4 million individuals who were eligible for this treatment. Simvastatin, a therapeutically equivalent product suitable for most patients, was available at substantially lower pricing. Data were sourced from the Health Insurance Review and Assessment Service database. They were supplied as the volume and subsidy price. Data included all community and hospital dispensing of subsidized medicine for the national population of approximately 50 million. Data were sourced from IMS Plus (2007 to 2014), which is a database of all public and private pharmaceutical sales in Singapore, including medicines for community and hospital use. Data included the retail sales price and volume. The national population was approximately 5 million. The primary outcome assessed was annual price per DDD supplied or sold in each country. Cumulative percentage price reductions over the first 4 years following entry of the first generic product to the market were calculated, using the year prior to the introduction of the generic product to the market as the reference year. Time-series analysis was used to assess the annual price per DDD and annual cumulative percentage change in price per DDD over time. The proportion of all lipid-lowering medicines supplied or sold in each country represented by atorvastatin in 2014 (2013 data used for Korea) was calculated. As a secondary outcome, the total volume of atorvastatin supplied or sold in each country was also assessed. A post-hoc case-study of pricing for atorvastatin in New Zealand is reported because the prices in New Zealand were generic equivalents for the branded product well before patent expiry; thus, the influence of generic pricing policies was not the major determinant of price. Information for the case-study was sourced from the New Zealand agency responsible for pharmaceutical management, PHARMAC. The results are reported in narrative form. Prior to the introduction of generic atorvastatin in 2006, the price for atorvastatin ranged from $0.10 per DDD supplied in New Zealand, to $0.87 per DDD supplied in Australia, $2.72 per DDD sold in Singapore and $2.89 per DDD supplied in the Republic of Korea (see [Figure 2]). 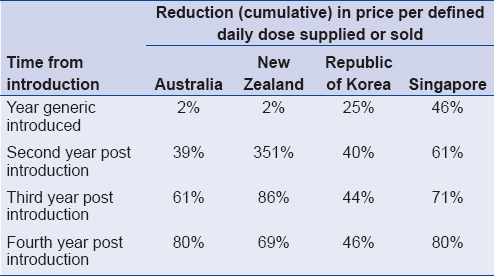 In all of the countries examined, the price per DDD supplied was already decreasing prior to entry of the first generic product (except for New Zealand, where it was already low). 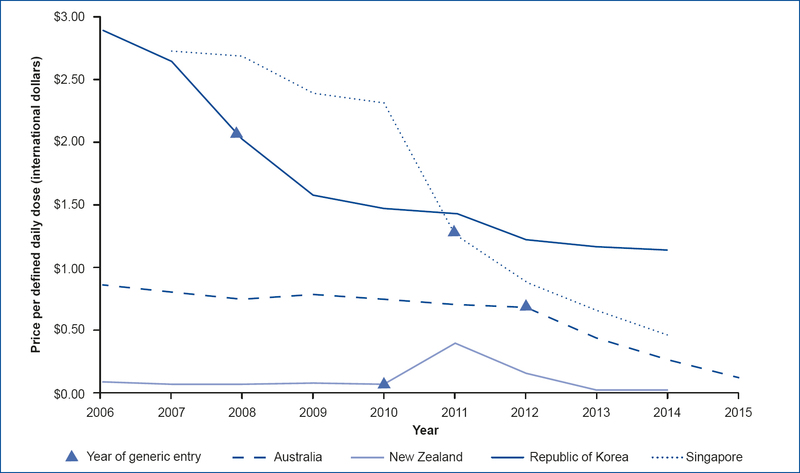 All countries except New Zealand had notable falls in the price per DDD at the time of atorvastatin patent expiry (see [Figure 2]). The published price in New Zealand was very low for the branded product prior to atorvastatin patent expiry, and rose in the year after the expiry (although a confidential rebate meant that the cost did not actually increase). However, it was always lower than the prices in all other countries and while there was an initial increase, the price per DDD subsequently declined, reaching one third of the pre-generic introduction price within 3 years. In 2014, which was the last year of comparable data in all countries, prices varied from $0.03 per DDD supplied in New Zealand, to $0.28 per DDD in Australia, $0.47 per DDD in Singapore and $1.15 per DDD in the Republic of Korea. The cumulative percentage price change after the introduction of the first generic product (see [Table 2]) shows that Singapore had the fastest initial decrease in price following introduction of the generic product. New Zealand was the only country to have an increase in price (although the cost did not increase) at any time following generic entry. By the fourth year after generic entry, the price had fallen by between 46% and 80% in all countries; however, there were still large differences in price between countries (e.g. $0.03 per DDD in New Zealand, $0.14 in Australia, $0.47 in Singapore and $1.43 in the Republic of Korea). 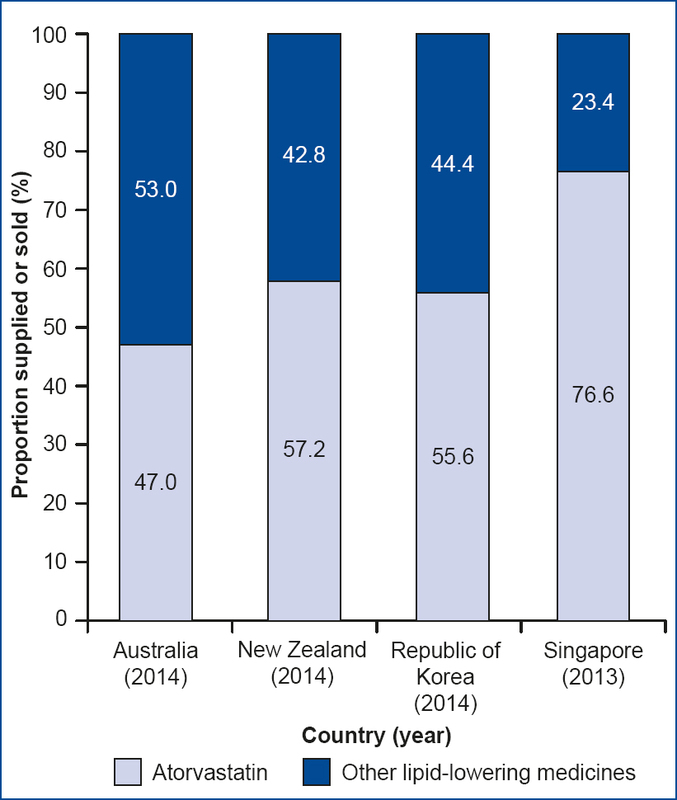 The volume of atorvastatin supplied or sold increased across the study period for the Republic of Korea and Singapore but was relatively stable in Australia (see [Figure 3]). No consistent relationship was observed between the volume supplied or sold and the price per DDD. The case-study of New Zealnad’s competitive tendering sytem’ is presented on page 104. This study has demonstrated widespread variation in the price per volume of use supplied for atorvastatin, both before and after the introduction of generic atorvastatin. All countries successfully reduced the price of atorvastatin with the market entry of the generic product, despite differing pricing policies and practices for generic medicines; however, the rate of decrease and the longevity of decreasing prices varied. The New Zealand tendering system and use of preferred medicines resulted in atorvastatin prices that were independent of the patent expiry, with very low prices established well before patent expiry, suggesting that generic policies have less influence on prices in markets where tendering systems operate and therapeutic alternatives are available. Singapore, which has free pricing coupled with tendering for medicines within the public sector, had the most rapid initial fall in price per volume of use after the introduction of the generic medicine, and maintained falling prices over the 4 years of follow-up. Australia, with its initial mandatory price cut, coupled with a mandatory price-disclosure policy, was observed to have the equal-greatest (with Singapore) cumulative fall in price. Australia’s Pharmaceutical Benefits Scheme does not restrict the number of generic products that can be listed on the scheme, and at the end of 2016 there were 15 different generic products listed for atorvastatin, possibly contributing to price competition. Prices in the Republic of Korea fell in a manner that was consistent with the mandatory price cuts of 30% in the first year and a further 10% in the second year. Based on the observable data, however, subsequent flow-on effects of reduced prices appear minimal, with only a 6% further cumulative drop in price per volume supplied in the subsequent 2 years. This was much less than observed in the other participating countries, which continued to see falls of between 20% and 30% in prices in years three and four post generic introduction, and may be due to there being no further price-reduction policies in place after the second year post entry. The New Zealand tendering model, which tenders across a therapeutic class and results in a limited preferred medicines list within therapeutic classes, suggests that low prices can be achieved, even where patent protection exists, and that in these instances other generic pricing policies may be less relevant. This model may be of particular relevance to low- and middle-income countries when formulating their pricing policies for generic medicines. New Zealand was the only country where an increase in published price was observed following entry of generic atorvastatin; however, at no time did the actual cost in New Zealand increase, owing to the presence of confidential rebates (Ms J Urlich, PHARMAC, personal communication, 16 October 2017). Additionally, at no time did the price of atorvastatin in New Zealand rise above the prices paid in any other country participating in this study, remaining at almost half the cost in any other country assessed. It should be noted that the cumulative percentage changes in price, which appear high for New Zealand in the year after generic entry, are relative to the baseline price and so need to be interpreted in keeping with the actual prices, which for New Zealand were lowest of all. The study findings of variable prices for medicines across countries is consistent with previous research showing wide variability in the prices of medicines. The majority of previously published research provides descriptive comparisons of policy implementation across countries;,, reports average effects of specific policies on a group of medicines, such as evaluation of the effect of reference pricing;, or provides estimated effects of price savings with full generic substitution., Less is known about other mechanisms for pricing of generic products. The present research found no other study that reports the results of the combined intervention of price regulation with mandatory price-disclosure policies, which was the Australian example. This study used price per volume of medicine dispensed or sold as its outcome measure. These results not only give information regarding the price achieved for generic products but also encompass the extent of use of generic products in practice, thus reflecting the overall savings achieved. This measure has also been employed in other studies that have evaluated the consequences of a combination of pharmaceutical policy interventions. As policies for generic medicines are usually implemented nationally, the present study does demonstrate the value of international comparisons for policy evaluation. A limitation of the study is that it was observational and descriptive in nature. The interventions that were compared all occurred in different years in each country, owing to different dates of patent approval and expiry. Other components of each country’s pharmaceutical policy, including the number of registered generic medicines, and the size of the market for lipid-lowering drugs, may also have had some influence on the results. The amount of atorvastatin used as a proportion of all statin therapy varied between countries, as demonstrated in [Figure 2]. While the proportion of the overall market accounted for by atorvastatin may have affected the initial price, the relative change in price after patent expiry should not necessarily be affected by market share. The study used price per DDD in order to allow for potential differences in strengths and pack sizes between countries. Consequently, the method assumed that price reductions due to patent expiry would not be different across pack sizes or strengths within each country, but would fall similarly. The results do not take into account patient co-payments, which also differ across countries, ranging from $0.25 per month in the Republic of Korea (2015), to $2.08–10.40 per month in New Zealand (co-payments reduced for different age groups between 2004 and 2007), and $4.27 or $12.63 per month in Australia (low-income versus general patients). Co-payments in Singapore vary, based on the patient’s paying status and the scheme under which the medicine is covered. For this reason, pricing comparisons must be interpreted with care, as the prices reported in this study reflect government costs prior to confidential rebates. Differences in patient contributions may have affected some of the differences observed in price per DDD. The New Zealand price per DDD, when only the branded product was available, was much lower than for any other country. This highlights a limitation in the study design when only the impact of the patent expiry is assessed and when use of other products in the class is not considered. The results of this study demonstrate the influence of four differing pricing policies for generic medicines in four countries from the WHO Western Pacific Region. In one jurisdiction (New Zealand), the price of atorvastatin was independent of the pricing policies for generic medicines, with very low prices achieved while the product was still on patent. In other countries, pricing policies for generic medicines were effective in reducing costs, with countries achieving reductions of between 46% and 80% in price 4 years post patent expiry. Differences were observed in the rate of change over time. Tendering systems (New Zealand, Singapore) resulted in particularly low prices. 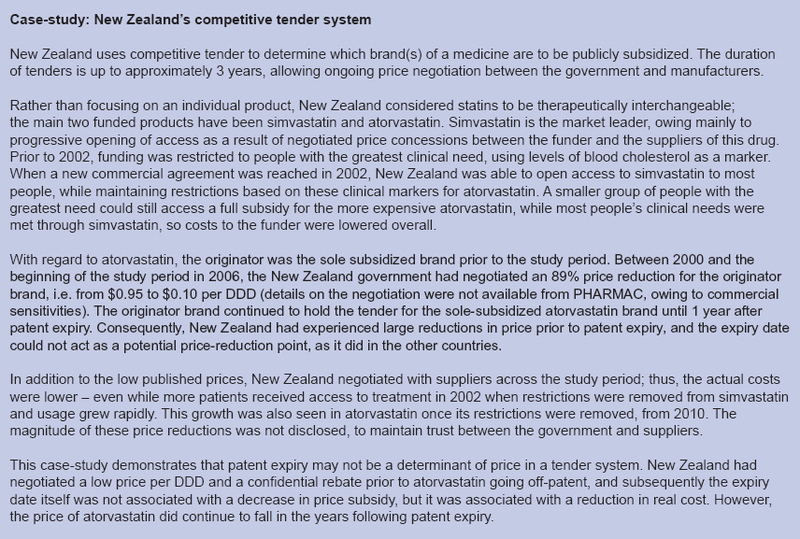 Where tendering and use of preferred medicines were the procurement mechanisms for atorvastatin (New Zealand), prices were lowest both before and after generic entry. Mandatory price cuts, combined with subsequent price-disclosure policies, produced similar relative percentage price reductions at 4 years (Australia). By comparison, mandatory price cuts upon generic entry as the sole measure were associated with the smallest relative reduction in price at 4 years’ follow-up (Republic of Korea). This study highlights the need to continually evaluate the effectiveness of implementation of policy for generic medicines and to consider the mix of strategies that maximizes value for money. Acknowledgements: We are grateful to PHARMAC, New Zealand, and the Republic of Korea Health Insurance Review and Assessment Service, for providing data for this study. Authorship: EER conceived the study. EER and AK-C drafted the manuscript, performed the statistical analysis and interpreted the data. D-SK and BO aided with data interpretation, assisted with acquisition of data and critically reviewed the manuscript. All authors read and approved the final manuscript. Dylst P, Simoens S. Generic medicine pricing policies in Europe: current status and impact. Pharmaceuticals (Basel). 2010;3(3):471–81. doi:10.3111/13696990801939716. Savings: $1 trillion over 10 years. Generic Drug Savings in the US (4th annual edition: 2012). Washington (DC): Generic Pharmaceutical Association; 2012 (http://www.gphaonline.org/media/cms/IMSStudyAug2012WEB.pdf, accessed 16 May 2018). Dunne S, Shannon B, Dunne C, Cullen W. A review of the differences and similarities between generic drugs and their originator counterparts, including economic benefits associated with usage of generic medicines, using Ireland as a case study. BMC Pharmacol Toxicol. 2013;14:1. doi:10.1186/2050-6511-14-1. Cameron A, Mantel-Teeuwisse AK, Leufkens HG, Laing RO. Switching from originator brand medicines to generic equivalents in selected developing countries: how much could be saved? Value Health. 2012;15(5):664–73. doi:10.1016/j.jval.2012.04.004. Simoens S. International comparison of generic medicine prices. Curr Med Res Opin. 2007;23(11):2647–54. doi:10.1185/030079907X233395. Acosta A, Ciapponi A, Aaserud M, Vietto V, Austvoll-Dahlgren A, Kösters JP et al. Pharmaceutical policies: effects of reference pricing, other pricing, and purchasing policies. Cochrane Database Syst Rev. 2014;(10):CD005979. doi:10.1002/14651858. Bergman MA, Granlund D, Rudholm N. Reforming the Swedish pharmaceuticals market: consequences for costs per defined daily dose. Int J Health Econ Manag. 2016;16(3):201–14. doi:10.1007/s10754-016-9186-4. Godman B, Sakshaug S, Berg C, Wettermark B, Haycox A. Combination of prescribing restrictions and policies to engineer low prices to reduce reimbursement costs. Expert Rev Pharmacoecon Outcomes Res. 2011;11(1):121–9. doi:10.1586/erp.10.87. Garattini L, Tediosi F. A comparative analysis of generics markets in five European countries. Health Policy. 2000;51(3):149–62. doi:10.1016/S0168-8510(00)00061-0. Hassali MA, Alrasheedy AA, McLachlan A, Nguyen TA, Al-Tamimi SK, Ibrahim MI et al. The experiences of implementing generic medicine policy in eight countries: a review and recommendations for a successful promotion of generic medicine use. Saudi Pharm J. 2014;22(6):491–503. doi:10.1016/j.jsps.2013.12.017. Nguyen TA, Hassali MA, McLachlan A. Generic medicines policies in the Asia Pacific region: ways forward. WHO South East Asia J Public Health. 2013;2:72–4. doi:10.4103/2224-3151.115849. Brekke KR, Grasdal AL, Holmas RH. Regulation and pricing of pharmaceuticals: Reference pricing or price cap regulation? Eur Econ Rev. 2009;53(2):170–85. doi:10.1016/j.euroecorev.2008.03.004. Ghislandi S, Krulichova I, Garattini L. Pharmaceutical policy in Italy: towards a structural change? Health Policy. 2005;72(1):53–63. doi:10.1016/j.healthpol.2004.02.012. Drug subsidies & schemes. Singapore: Ministry of Health; 2018 (https://www.moh.gov.sg/content/moh_web/home/costs_and_financing/schemes_subsidies/drug_subsidies.html, accessed 16 May 2018). SingHealth. About Us (https://www.singhealth.com.sg/AboutSingHealth/GroupProcurement/AboutUs/Overview/Pages/Home.aspx, accessed 16 May 2018). WHO Collaborating Centre for Drug Statistics Methodology. Use of ATC/DDD (https://www.whocc.no/use_of_atc_ddd/, accessed 16 May 2018). World Economic Financial Surveys. World Economic Outlook Database. October 2016 edition (https://www.imf.org/external/pubs/ft/weo/2016/02/weodata/index.aspx, accessed 16 May 2018). Vachris MA, Thomas J. International price comparisons based on purchasing power parity. Monthly Labor Review. 1999;October:3–12 (https://www.uni-trier.de/fileadmin/fb4/prof/VWL/IWB/Vorlesung/neu/Purchasing_Power_Parity.pdf, accessed 16 May 2018). Australian statistics on medicines. Canberra: Australian Government Department of Health; 1997 to 2015 inclusive (https://www.pbs.gov.au/info/statistics/asm/australian-statistics-on-medicines, accessed 16 May 2018). Ministry of Health. Prescription charges z(http://www.health.govt.nz/your-health/conditions-and-treatments/treatments-and-surgery/medications/prescription-charges, accessed 16 May 2018).